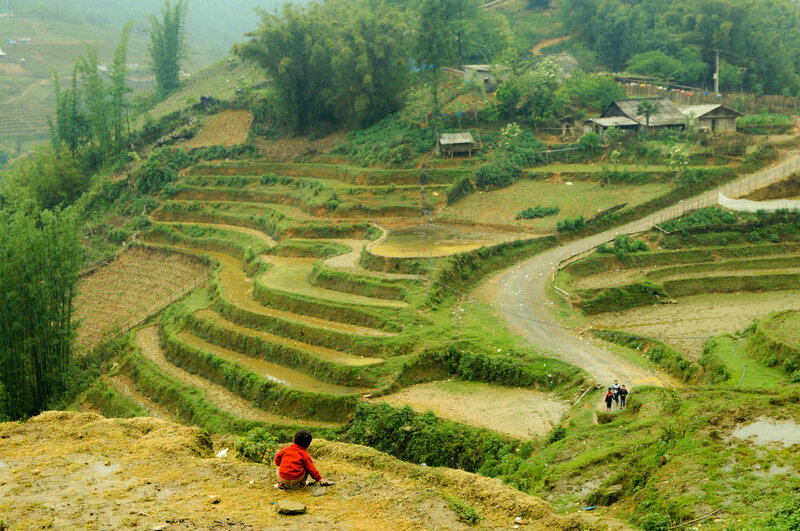 The reason why we wanted to go to Sapa is to see those beautiful rice terraces. We didn’t check the weather before we departed from Hanoi and we arrived to a wet, cold and foggy Sapa. We weren’t prepared for that at all and had to buy some warmer clothes first. It is located very close to the border to China. The town is 1500m high up the mountains. It was a French hill garrison back in 1922. It overlooks a steep valley, with mountains towering at the sides. Most of the locals live of tourism. We stayed at “Go Sapa Hostel” which was about 10min by foot away from the center. We stayed in a private room for 3 nights. Pricewise, there were only a few Euros difference in either taking a private room or a shared room. The room was very clean and very big. They also had a big common room where you were able to make your own food. But they served food as well. Because the hostel was located further up a hill, it offered a beautiful view of the valley below us. The first thing we did in Sapa was exploring the city. We also went on the Cat Cat Village trek. You have to pay a small entrance fee to do the hike. It can get quite touristy as well. Sapa market is also very recommendable to have a look at. They sell all kinds of fresh products there. As well as the crafts and fabrics shops. We tried some delicious local food and stayed away from the western restaurants because well, its nothing new for us and they are mostly super expensive in comparison. We are city walkers, so I would say, take time for a whole day to just walk around the city and discover it. Don’t just use the main roads, use the back alley’s as well. And of course, go hiking! I also heard from fellow travelers that they recommend home stay at the local’s villages and towns but we didn’t have enough time to do it. The terraced rice fields when they are at their full boom. Check the weather app before you decide to go to Sapa. We arrived unexpectedly to a very foggy and rainy weather which prohibited us to do much. At time you couldn’t even see the end of the street. A lot of locals will be selling their things to you. You should always answer them with a definite “yes” or “no”. Else they will follow you until you buy it. On the first day, we told a group of women that we will think about if we want to buy something they offered. After an hour that group of women found us and started to complain that we promised them to buy their stuff. It felt very uncomfortable especially when they started to speak their language and giving us mean looks. Most of the locals, travel by foot to Sapa in hopes to sell their homemade products to tourists. With the money they receive they support their families back in their villages. I was already planning to explore Vietnam by motorbike. Why? To be ultimately free and go wherever I want to go. Explore those beaten tracks not every backpacker has taken yet. I heard about this most northern loop from another backpacker I met in Laos. After a little google session about the area, I realized where I was about to plunge myself into. I was sold. Stunned by the pictures of the amazing scenery and roads yet to be discovered. Let's go! After buying my beloved new motorbike I took off from Hanoi and was heading for my first stop. Ba Be Lake. I would recommend this place to everybody who is heading for Ha Giang. Stunning views and very welcoming people. Plenty of homestays where you can spend the night with the still remaining ethnic Tay people. The road is long and curvy to Ha Giang. Planning ahead and picking your towns to stay the night is crucial. Still interested? Well, the more north you go the more mystical the landscape gets. You will find yourself driving alongside massive limestone peaks in the mountains and looking down into giagantic valleys people built villages in. The people talk different, eat different and dress different. 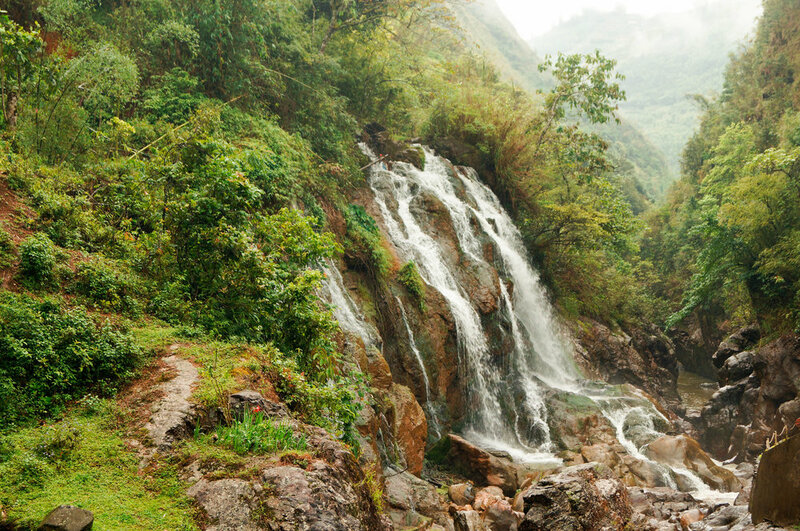 Ha Giang is the most northern province of Vietnam and the last frontier bordering to China. Dorm rooms and clean facilities. They organize family dinners where you can eat local dishes with the staff and locals. Most popular in town and great for running into other backpackers. Affordable private room with 2 beds so even cheaper when sharing the room. Private room which I shared with some other bikers. Private bathroom, TV and Wi-Fi included. After a long day of riding the only thing I cared for was a bed and a shower. Overall this is about the whole experience of riding the most northern loop of Vietnam. Getting to know the true north of Vietnam. Enjoying the unreal sights from the edge of a cliff. Interacting with the shy but friendly ethnic groups living in the mountains. Tasting their local dishes. Playing with those colorful dressed children. Wanting to stop every 10 minutes to make a better picture of the scenery than the last one. Because really, the environment seems to change every blink of an eye. From driving in the clouds to braking your way down a steep hill and an endless amount of U-turns until you suddenly drive in the most rural village between massive pinnacles of limestone. Think about this: Burger King, KFC, Starbucks, McDonalds, milkshakes, pizza, hotdogs, pasta.. Think more like rice in every form (steamed, sticky, noodles, pancakes, porridge). Look for Bahn Mi. Delicious sandwiches with fillings like pork belly, fish cakes, meatballs and not-messing-around chilies. My everyday lunch was Phở Ga. Noodle soup with chicken, herbs and spices, lemon and chili. A must do is definitely climbing The North Pole. A gigantic tower carrying the flag of Vietnam. After climbing the staircase to the base of the tower, the views were already magnificent. Climb up to the very top of the tower and you'll have a spectacular 360 degree panorama view over the Yunnan province of China. If you made it this far. Congratulations! You made it to the most northern part and last frontier of Vietnam. During my trip there was this annual festival down in the valley. A small and simple village was packed with people from all kinds of tribes. All the women were dressed up as colorful as they could with their traditional tribe clothes on. When I drove a little bit further I noticed the men showing off their strength by competing in games like rope pulling to impress the ladies. Or should I say future wifes? Take - your - time. Explore, taste, play, see and enjoy your time in the present. Because by the time you have left the north and start heading somewhere else, you are going to think back about this beautiful and remote place. Be aware of the weather conditions in the time of the year you're planning to visit Ha Giang Province. It can get pretty chilly up in the mountains in contrast to the warm and tropical south of Vietnam.